Four schools have had their participation in the 2019 Children’s Mashramani Costume and Float Parade secured thanks to sponsorships to the tune of $500,000 from the Ministry of Education. The Ministry made the announcement in a press statement and revealed the benefitting schools as the Tucville Primary and Secondary Schools, St Margaret’s Primary School, and St Winefride’s Secondary school. The parade is scheduled for February 16. To make the participation of the schools a reality, on Monday, teachers Ms. Adriana Tobin, Ms. Sunita Durgah, Ms. Coleen Mc Taire and Ms. Christine Jordan each received materials to assist their respective schools to be represented at the national event. “The materials are to be used for the creation of costumes even as the Unit of Allied Arts will also be financing the construction of the costumes,” the ministry said. Further, the unit has also committed to providing the needed transportation for the students’ participation from the four schools. The total sponsorship for the four schools has been valued at an overall cost of about $500,000. 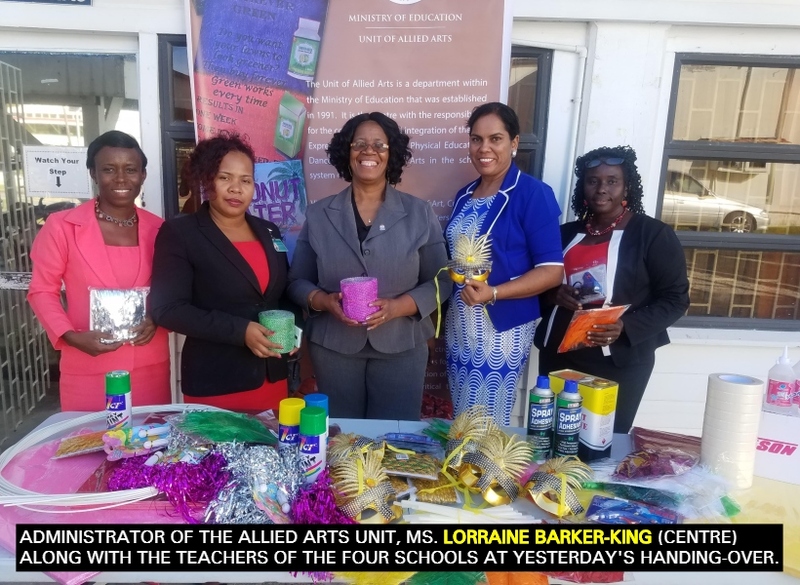 Ms. Lorraine Barker-King, Administrator of the Unit of Allied Arts, handed over the items and described the gesture as a tradition to select and support some schools annually. She said, “These schools are selected on the basis of their willingness to participate but their inability to do so because of various reasons”. Among the items handed-over were shimmering materials, glue guns and glue, pompoms as well as face masks etc. According to Ms. Barker-King, the idea is to foster a more collaborative approach that encourages the involvement of parents at home, the students and teachers at schools and the community as these stakeholders will all be relied upon to lend their creative abilities towards costume construction.